I do not know of a single human on this planet who enjoys mosquitoes, ticks, roaches, or creepy crawlies. Barring the entomologist in the world, being outside with bugs can mess up a perfect camping trip. Fortunately, there are many options to spray around and life is good. However, in a grid down scenario, we will not have the luxury of heading to the local big box and getting a new can of mosquito, roach, or wasp spray. Listen to this broadcast or download “SHTF Pest Control” in this player! In this show, we will be discussing some ideas for SHTF pest control and how to keep the bugs out when you bug out. 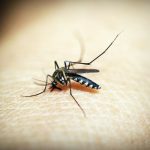 We will go over why you personally make an ideal mosquito magnet. Did you know that your genetics have a lot to do with why mosquitos love you? We will go over your epidermal bacteria, blood type, sweat, acids you produce, the amount of carbon dioxide you exhale, and your natural body temperature. Do you love beer…so do mosquitoes and they are more attracted to those who drink beer, not alcohol in general, just beer. Vodka and Gin drinkers rejoice! We then move into the problems and risks that the pest being with them. We will cover fun items like Lyme Disease, Zika, and Plague. Next, we will cover what you can do to repel mosquitoes, ticks, roaches, as well as some other pests. Do you use wristbands and essential oils to repel bugs? Do you think it works…I don’t. I do use and will discuss DEET, Oil of Lemon Eucalyptus, Picaridin, Permethrin, Citronella, and a few other interesting items. Do you keep Boric Acid or Diatomaceous Earth? You should. Do you keep a few extra cans of bug spray, ant poison, or wasp spray? What will you do if common household items are no longer available? If you not an entomologist then join me for SHTF Pest Control and learn some tricks for combating the creepy crawlies. Next: Next post: The effects of nuclear exchanges!